What Exactly Was the Power Train ’66? Chicago Burlington & Quincy Railroad’s locomotive No. 307 took to the tracks in August of 1965 with more than 30 rail cars in tow, as it embarked on a cross-country journey to show off Deere’s new products. The train reached nearly 3/4 of a mile long and carried more than a million dollars worth of John Deere equipment. The spectacle was Deere’s largest product introduction to date. What kind of Equipment was Hauled? The 1966 equipment line included four new tractor models and 43 new implements. The new tractor models included the 2510, 1020, 2020, and the 132 horsepower 5020 tractor, which was known to be the most powerful standard tractor in the world at the time. A number of tillage tools, planters, loaders, a hay cuber, and baler headlined the new set of implements that were now available to customers. 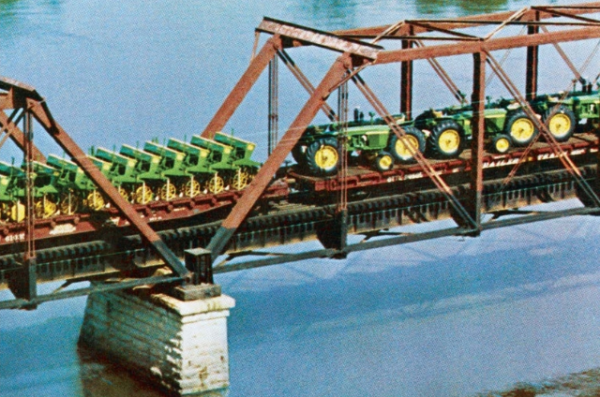 What Else Did John Deere Marketing Do in ’66? The impressive train of farm equipment wasn’t a standalone act during the 1966 new product intro. The company also assembled and mailed out a 96-page, full-color catalog to their 650,000 customers in the United States and Canada with a gross income of $10,000 or more. John Deere continues to impress its customers each year with new products and new equipment ranging across industries. However, John Deere marketing really made a name for itself back in 1966 thanks to this display of pride for its equipment and appreciation for its customers alike. Take a look at John Deere’s Plowshare for more information on the Power Train ’66 product introduction and to learn more about Deere’s history, products, and events.